I hope I’m squeezing in this recipe in time for your St. Patrick’s Day baking! 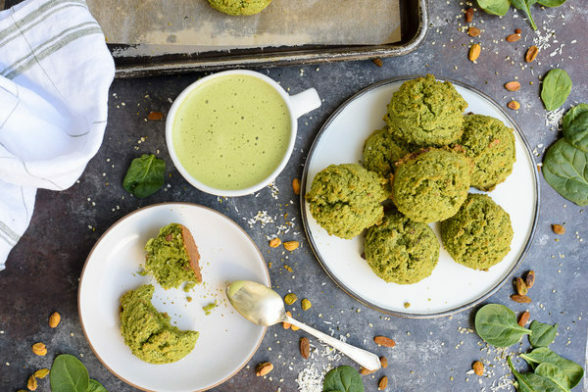 I know how much fun it is to surprise the kiddos with green treats on St. Patrick’s Day. I have had amazing feedback from the “green” recipes I have posted in the past. 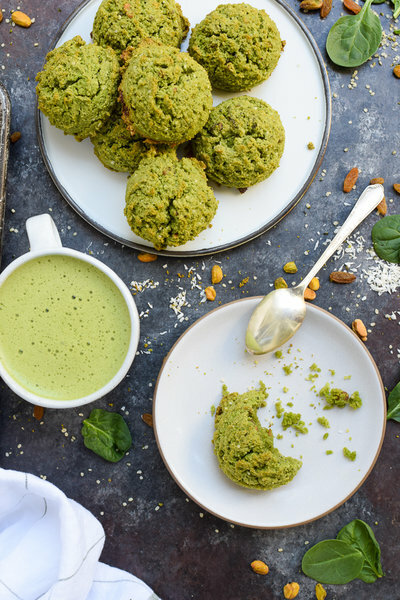 If you’re new here, you must check out these green muffins, this vegan mint chip smoothie, green pancakes, and this matcha chia pudding parfait. If you’re looking for something savory, I always make this vegan split pea and barley soup with whole wheat Irish soda bread. My family loves it so much, I make it often in the colder months. This recipe I am posting today is a twist on the coconut breakfast cookies I developed for The Chalkboard Mag. I call them “breakfast cookies” because they look kind of like cookies, but they’re low enough in sugar that you can eat them for breakfast. They are also high in protein, fiber and good fats, which are essential to start my day. This is the blood sugar stabilizing trio that I always aim to include in every meal, but especially breakfast. No need to start my day on a shaky note. Even though I eat plenty of whole grains like brown rice, farro, barley and quinoa (I know, technically not a grain), I really like grain-free baked goods. Have you checked out the recipe I just posted for a terrific grain-free sandwich bread? I have shared many, many grain-free recipes here, too many to list. But like I’ve mentioned before, grain-free baked goods just hold their moisture really well and last a good long time in the fridge without their texture suffering. I call these cookies, but I think you could call them scones and get away with it. Or macaroons since they are a combo of coconut and almond. In fact, you can make small versions of these and serve them on Passover or Easter. They really easy to make and they last for about 5-7 days (maybe more) in the fridge in a covered container. I will admit that the color of the batter is much more vibrant green before baking. But I still think these will pass muster on St. Patrick’s Day and the days leading up. I know a lot of you are looking to me to help with making things vegan since my husband is vegan. I have not tried this recipe with an egg substitute, but there’s a product called Neat Egg that I think could work here. Aquafaba whipped with cream of tartar should also work. You’ll need about 6 Tablespoons of liquid from a can of cooked chickpeas + 1/4 teaspoon cream of tartar whipped with a mixer fitted with the whisk attachment for about 6-8 minutes. For those of you who are nut-free, always remember that we cannot sub grain flours for almond flour. We can’t sub coconut flour for almond flour either. Go get a few bags of spinach people, and start making some green food! Preheat the oven to 325 degrees. Line a large baking sheet with unbleached parchment paper or a silicone mat. 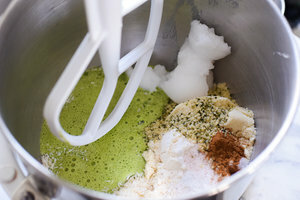 In the bowl of a mixer, use the paddle attachment to combine the almond flour, coconut flour, baking soda, salt, cinnamon, hemp seeds, coconut flakes, and coconut oil. Place the spinach, eggs, maple syrup and vanilla extract in a blender and blend until completely liquified. Pour into the mixing bowl and combine well. Stir in the raisins and pistachios/chocolate chips. Take ¼ cup of the batter and dollop onto the prepared baking sheet. I use a large ice cream scoop to do this. Bake until the cookies are lightly golden on the bottom and a little dry on the outside, about 25 minutes. Allow to cool on the baking sheet 5-10 minutes. Then transfer to a cooking rack to cool completely. Store in an airtight container for 1 day at room temperature and up to one week in the refrigerator. 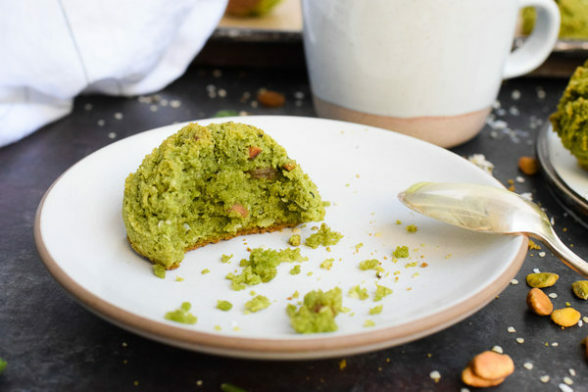 * I used pistachios for the greenish color, but they are not necessary for this recipe. Feel free to omit them if you don't have them or don't care for them. My kids and I actually prefer these cookies with dark chocolate chunks. Another sugar-free alternative is raw cacao nibs. A favorite in our house for St. Patrick’s Day. I just made up a batch of the green muffins, your grain free banana muffins (from your cookbook) and have the dry ingredients ready for the green pancakes. Needless to say it has been a Pamela Salzman day in my kitchen. my name is Blair i am 9 years old. me and my mom just made these . we substituted chia seed (because we did not have hemp seeds) and we added pistachios and chocolate chips 🙂 we left out the raisins because we do not like them. Well hello, Blair! I am delighted to hear form you and I’m so impressed with your substitutions. Thank you for writing in. I’m so glad you enjoyed the cookies. Stay in touch! Our little Grandson came to visit over the weekend, so we made these for Saint Patrick’s Day! These are surprisingly delicious and satisfying! I used chocolate chunks and they were yummy. Next time I will try only pistachios. I will for sure make them again for “grown-ups” only…they are a great “grain free” treat. Thank you! Great! I just polished off the last one for breakfast and it really sustained me until lunchtime with no sugar crash. Glad you enjoyed them! I just made these and they are amazing! I added dark chocolate chips, and my kids devoured them. 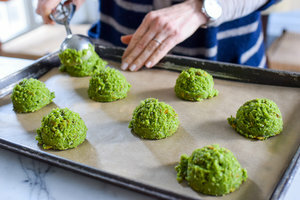 I’ve never been one to make St. Patrick’s Day treats, mostly because the recipes you see are not very appealing or full of a nasty ingredients. But I’ve said this before, your recipes are fantastic! Thank you, thank you, thank you! Yay, yay, yay!! I am totally with you. Even though I grew up Catholic and we “celebrated” St. Patrick’s Day, we never did any treats because they were all so awful. Thanks for the nice comment! Soooo how would these taste without the maple syrup? Just finished Whoke 30 and would love to make these but I have not introduced maple syrup back into my diet yet! What do you think? If you can do dates, you can try doing a date puree a la the date sweetened banana bread recipe on the site. Or you can try adding 1/4 teaspoon stevia. You’ll probably need to add a little moisture in the form of almond milk or something. It’s worth a try! I don’t know if they would be sweet enough without the maple, but maybe your tastebuds have adjusted! OMG I can’t wait to get home tonight and make these !! They look so fun and delicious !